Benefits Of Hibiscus Leaves For Health - Healthy T1ps - Hibiscus, beautiful flowers this certainly is not foreign anymore. Plants are easily encountered in these villages is indeed pleasing to the eye, with a colorful flower colors are quite alluring indeed our eyes for a moment to see and pick it. Perhaps you gentlemen there who wonder why it is called as hibiscus whereas in terms of form there is not a similar-similarity to the shape of the shoe, but who would have thought it the name of the shoes are pinned on this plant because of yore flower often used by people to shine their shoes so that more shoes look clean and shining. So now we know ya that one of the benefits of this plant is to shine shoes, but that is sure to take precedence in this blog are the benefits in terms of health and treatment. Before we know the benefits of herbal hibiscus plants maybe we need to know a little about this plant. 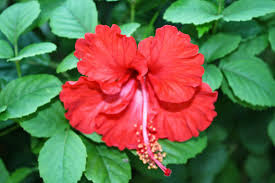 Hibiscus is a plant form of shrubs. The growth of these plants stand upright with a height range of 1 to 4 meters with having many branches. For leaves, hibiscus single leaf with ovoid shape and has a tapered tip and serrated edges rough. So this leaves the one who is the basic ingredient that can be processed or formulated to be an herbal remedy for several diseases, is due to its antiseptic properties as well as the contents of substances contained. Some examples of substances contained in the leaves of hibiscus are flavonoids, tannins, saponins, calcium oxalate, peroxidase, Fat, Protein, Taraxeryl acetate, scopoletin, Cleomiscosin Cleomiscosin A and C.
50 grams of hibiscus leaves boiled with ½ liter of water with ½ papaya leaves with English added 10 grams of salt. Wait until boiling then strain and drink was the water while still warm. Take necessary hibiscus leaves mixed with water that has been cooked and then squeezed to take water. Drinking water from the squeezed until the originals. The way is only with hibiscus leaves and herbs to taste mashed Hibiscus mutabilis then being placed on the mumps. Previously prepared bottles that have been filled with water and then download the hibiscus leaves to taste until smooth. Put the results of these collisions into bottles that had been prepared previously. Whisk until well blended, then set aside for waste water with added lemon. Wear these ingredients routinely 2 times a week with a way to rub it into hair evenly. How already explained the benefits of hibiscus plants that I described above? Our advice when there's hibiscus plants around the yard of the house, to no longer just take the flowers to shine shoes but also to take advantage of their leaves some kind of alternative herbal treatment of diseases such as those discussed above.